I just completed half a year of working as a volunteer veterinarian in Sangkhlaburi, (a rural community in northwestern Thailand), managing a veterinary clinic and a dog sanctuary. When I presented my project to the Bayer Science & Education Foundation during the interview process for the Carl-Duisberg-Stipend my plan was to work in a veterinary clinic side-by-side with a senior veterinarian to create and manage education and awareness projects within the community. When I started working in Thailand, my project quickly changed into something much bigger than I had originally expected! The senior veterinarian left the organisation shortly after my arrival to further develop skills with a different charity, which gave me just enough time to learn my way around in the clinic before managing the clinic and the dog sanctuary by myself. This also made me the only veterinarian available within a radius of a several hours drive. Less than one year after my graduation as a vet this task was certainly a huge responsibility and a big challenge, but I enjoyed it immensely and quickly became very self-reliant and confident as a clinical veterinarian. I treated wounds, infectious diseases and injuries caused by car accidents, performed various surgeries and provided care for emergencies, such as poisoning events. Managing the dog sanctuary with its 55 dogs, two employees, and many volunteers from all over the world made working in Thailand a challenging but great experience. Because of my special interest in One Health, I always prefer to approach situations keeping the bigger picture and the long-term effects of all initialized actions in mind. It was especially important to me to not only-treat individual cases of sick animals, but also to be active and involved on a population medicine level. In our very proactive team of volunteers we set up spay and neuter camps outside of Sangkhlaburi to give those people unable to visit us access to healthcare and reproductive control for their animals. Furthermore we also performed castrations on our stray dogs and cats in Sangkhlaburi to improve public health and animal welfare in the community. Education and awareness regarding spays and neuters is extremely important to promote animal health in Thailand. Reducing the number of dogs in future generations, as well as vaccinations against rabies, also minimize human-animal-conflicts, the pathogen burden, and therefore the risk of spreading infectious and zoonotic diseases. For this part of my project it was especially important to first build a relationship of trust with the local people. Together, with engaged community members, we went out in the mornings to catch stray dogs and carry them to the clinic on our little scooter, where I would perform surgeries throughout the day. 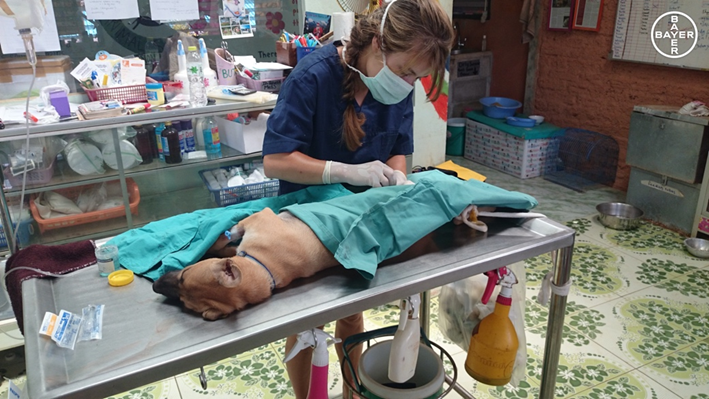 We managed to sterilise hundreds of animals through this fantastic and adventurous team effort between the clinic and the community members, and this had a significant impact on the stray animal situation in Sangkhlaburi. Especially important to our efforts were the people at the local market; they not only fed the stray dogs to make catching them easier, but also provided us with delicious Thai street food and fresh fruits as a way of showing us their appreciation for our work. I was also introduced to the monks in the temple in Sangkhlaburi. Monks in temples and monasteries in Thailand care for a large number of dogs and cats; the temples are almost like sanctuaries without fences. Through the support of local friends I was able to explain my work, goals and ideas to them and offer our reproductive management and veterinary care to their dogs and cats – an offer which was greatly appreciated. Catching dogs with the monks on the temple field quickly became one of my favourite memories from my time in Thailand: laughing together when a dog was faster or smarter than us, escaping before we could reach it. Without building these bridges between our clinic and the community, this kind of work could never have been possible. It was exciting to be the one to initiate this project in this wonderful rural Thai community.